Great things are happening and the room should be back open for use very soon! We urgently need of £3000 to pay for this work. All donations very gratefully received. IF YOU CAN'T GIVE, PLEASE SHARE! We want to get some crowdfunding going so please share the page as wide as you can. The replastering of the internal walls was finished in January 2019. We thank Dale Burford and Surebuild Ltd for their hard work. The electrics are sorted and we will be open for business in March! Thanks to every one who helped with the clean up on 9th Feb. 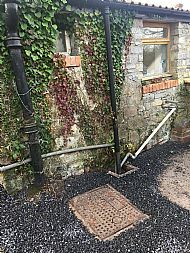 The new drain will reduce the damp in the kitchen and toilet. We thank the late Tony Bates, Aquablast and Jon Bethell for helping with this. 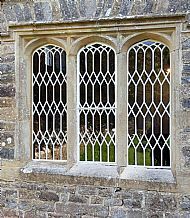 The second window will be back in early 2019. We thank JH Stained Glass of Bristol for their help on this work. Quiz Night on 22nd February was another storming success. £650 was added to our funds! Weare Church June 15th and 16th. A church brimming with beautiful flowers on the theme of Weddings, with contributions from across the United Parish. Teas and refreshments in the Churchroom Saturday and Sunday afternoon. Whilst the room is currently closed for functions, we can take bookings from 1st April 2019. if you wish to view it, it is generally open between 10am and 11.30am on the 2nd and 4th Sunday of each month or by arrangement with Anna Fox, Sarah Pettifer or Ruth Orriss. The Churchroom at Weare was in need of major renovation and we are looking at an exciting project which will not only make it fully accessible, but also make it a hub for the whole Parish. This Grade 2 listed building in the churchyard of St Gregory’s Church, in Weare was built 175 years ago as a school room. We hope to make it a fresh and accessible building for use by the whole community of Crook Peak Parish. 1. No adequate disabled access. 2. No adequate emergency exits. 3. A single toilet that is only acessible through the kitchen and is exceedingly damp. 4. A kitchen that is not adequate to serve the size of the room. 5. Crumbling and draughty windows. 6. Walls that are lined with asbestos. It could be a great venue for up to 60 people, close to the Rectory and St Gregory's Church. Ideal for funerals, baptisms and small weddings, as well as a range of meetings, events and parties and even children's work in the future. If you have skills or talents that could help this project, please get in touch.